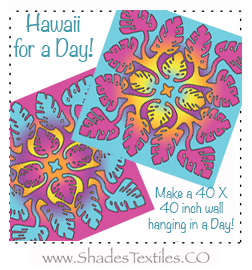 Hawaii For A Day - How to make a 40 X 40 inch Hawaiian Style wall quilt in a Day! In this class, we will learn the basics of how to make a Hawaiian Style quilt using machine applique and machine quilting techniques. In the class, we will trace, fuse and cut the design. Then we will fuse it to a background. In most cases, in a convention center classroom, this will be taught in a No-Sewing machine room. The quilting part will be demonstration only. At a guild, or anywhere the students can bring their own machine, the last part of the class is hand on starting to finish the project. The kit includes the pattern, and SoftFuse Premium. The student brings the fabric - 2 pieces of pre-washed, dried and ironed fabric - 40 X 40 inches Square min. in 2 contrasting colors. Bring a second background if you feel up to the challenge of making 2 wall hangings.